I visited New Orleans for the first time during Easter of 2017. The city's vibrant culture was electrifying, steeped in a rich and colorful history. Something about the place, likely that any bar or restaurant will let you take your drink to-go, and one can wander the French Quarter drink in hand, drew me in immediately. New Orleans cuisine consists mainly of a mixture of creole and Cajun food. As it happens, the city had a connection to my native Canada that I did not discover until my visit. It turns out that Cajuns are originally natives of Nova Scotia, a present day province of Canada, previously known as Acadia. 'Cajun' is a misnomer of these people, known then as Les Acadiens, who were exiled from the province in the mid-1700s. Many of thsee French-speaking settlers made their way south to Louisiana, settling down in what is present day New Orleans, giving the city its unique French flair, and heavily influencing its language and cuisine. Unable to waste even a moment of previous time not exploring the city, we started the trip with a stroll towards Jackson Square, picturesque with the backdrop of the St. Louis Cathedral in the moonlight. My exhaustion from a late night flight into the city was assuaged by a midnight dinner at Coop's Place, a locals favorite serving up some of the best fried chicken and jambalaya in New Orleans. Starting a meal with a bowl of homemade, authentic jambalaya is definitely the way to go if, like me, you haven't eaten for the night, or if the soup is as hearty as this one. A native dish of Louisiana with both Spanish and French influence, it will typically have sausage, seafood, other types of meat such as crawfish, shrimp, and chicken. Onion, celery, green pepper, rice and a thickener of some sort will also be thrown in to the mix. Curious to try everything on the menu, I opted for the taste plate at Coop's Place. The fried chicken the restaurant is known for did not disappoint. Hands down some of the best fried chicken I have ever had in my twenty two years. Day one started with, you guessed it, more food. Cochon, literally French for 'pork,' is a popular lunch and dinner destination for authentic Cajun and southern cooking. My personal favorite are their moderately priced appetizers, and its lively interior. To satisfy my curiosity, I tried the two more uncommon items on the appetizers menu: fried crocodile (left) and fried livers with jelly (right). Both dishes' main ingredients are non-metaphorical interpretations of their names. The crocodile wasn't as tough as I imagined it would be, and, as they say, tasted like chicken. It went well with the tangy 'slaw and ranch-like sauce the dish came drenched in. 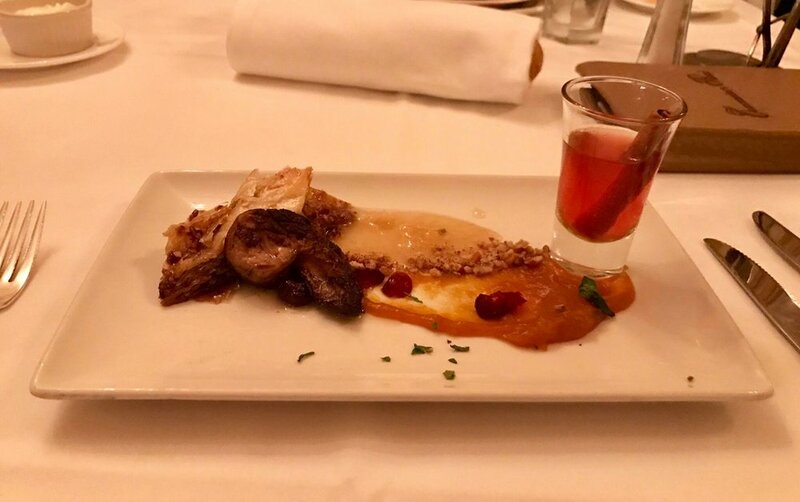 The creamy texture of the liver was well juxtaposed with its fried crispy exterior, and its meaty flavor heightened by the simple sweetness of the jelly paired with the dish. One thing I quickly noticed about eating in New Orleans, oysters feature abundantly in nearly every menu I was presented with. This is likely due to its proximity to the Gulf, but nonetheless, I for one could never complain about too many oysters. Served wood fired at Cochon, these pretty morsels were glazed with a well balanced chili garlic butter, giving it that extra kick. As I was on vacation, and this meal was essentially lunch, it's never too early to get started on imbibing. The flights at Cochon caught my eye. Typically reserved for wine tasting, this eatery offers up flights of whiskey, bourbon, or both. I certainly couldn't resist. As a main, I opted for the charcuterie plate, which featured headcheese, various cuts of cured and dried pork bits. Definitely the dish for a sample-happy person, especially if you enjoy cold-cuts. The pickles were also an excellent addition to even out the salt in cured meat. After a sufficient amount of eating, we were finally off to our first tourist destination, and arguably a hallmark of what the state of Louisiana is associated with, the bayou. On our way out the city, we were graced with a panoramic view of New Orleans, with the taller buildings of the central business district in the distance. Upon arriving at the docks of the bayou, we board our boats to explore the swamp, and in pursuit of (hoprefully) crocodile sightings. Onwards into the bayou, featuring a variety of never-before-seen vegetation meant to survive half immersed in shallow waters, and a scenic cruise into the open expanse of the interconnected riverways drawing its waters from the Mississippi. Along the way, we get acquainted with a surprising number of unnerving, albeit relatively small, crocodiles. Curiously, the local guide entices and feeds them with marshmellows, of all the things one would imagine a crocodile to favor (meat, anyone?). The feeding is done via sticks, naturally, lest anyone lose a few fingers on this otherwise tranquil cruise through the water. The bayou we went to is approximately half an hour out from the city, not too far and definitely not a bad way to spend an afternoon getting up close and personal with some 'gators. Coming back into the city around 4pm, we decided to take a stroll in what is arguably the most central tourist area of New Orleans - the French Quarter. Also known in French as the Vieux Carré, this district is the oldest neighborhood in the city, founded in 1718. Stretching out for a few miles in either direction, the area was larger than I'd expected, and far livelier. Parades for various occasions are common occurrences in the quarter, distinctively marking the Spanish part of New Orleans culture. Don't be surprised if you see one at random, like this one below. We started our survey of the quarter at its centermost point, Jackson Square. Named for its statue of Andrew Jackson at the center of the square, the landmark is also flanked by St. Louis Cathedral and Café Du Monde, which serve up the famed beignets that have become synonymous with the city itself. A quick note about Café Du Monde, the establishment is open 24 hours, 7 days a week. 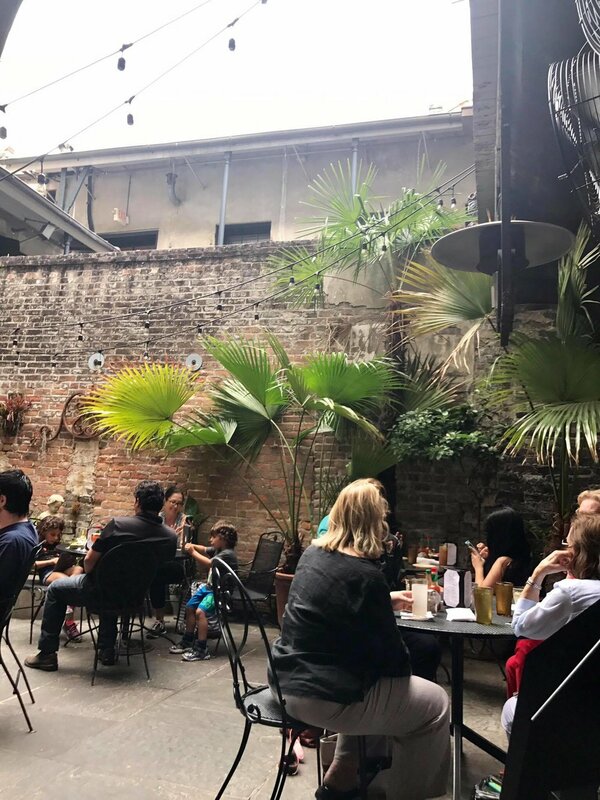 No need to spend hours in the line that line the café most days, come by late at night or in the early morning after exploring a few jazz venues on Frenchmen street. As it was approaching dinner time but having only managed to squeeze in a reservation for the popular Commander's Palace restaurant at 9pm, we opted for a bar hopping and snacks within the area instead. 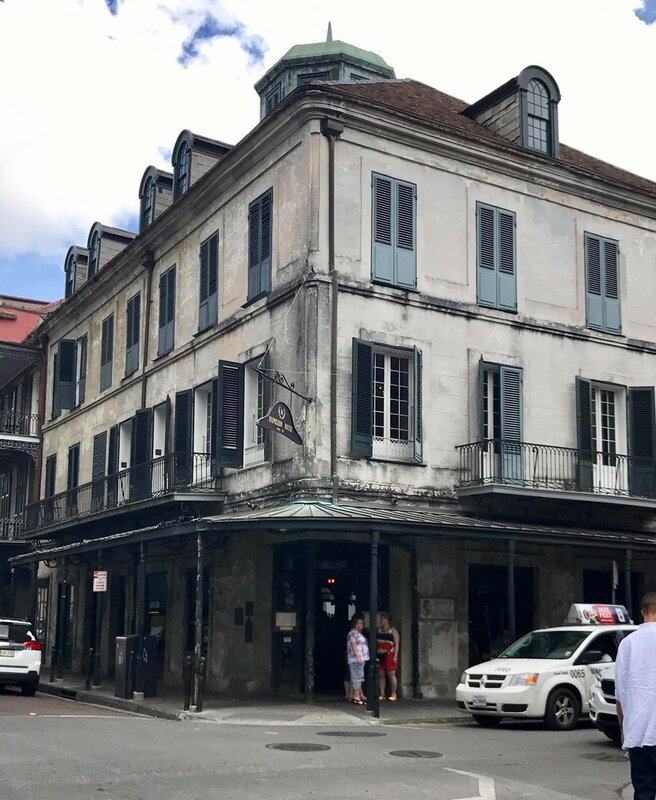 First stop, Napoleon House, famously constructed for the namesake general by the then mayor of New Orleans, who wanted to rescue him from exile and provide him refuge in the city. The general never made it, as he died during imprisonment in the early 1800s. The building is distinct in its dated façade and weathered shell, purposefully preserved to this day. Napoleon House is credited with the invention of the Pimm's Cup cocktail, so naturally a most-order if you come by. They serve it up in three different variations, but as I didn't like my cocktails overly sweet, I opted for the original. Also noteworthy is the Boudin sausage, a staple of Louisiana comprised of minced pork and rice. The mustard on the side here does well to even out the umami taste of the meat mixture. After Napoleon House, a quick stop at Pat O'Brien's, a bustling bar known for its invention of the hurricane. The drink itself was too sweet for my taste, but nonetheless a solid choice for anyone looking for an afternoon cocktail. As is typical, there is also a outdoor courtyard in the establishment, in addition to two indoor bars on either side of a vaulted, Harry Potter-esque walkway. Our final stop for the afternoon was in search of something sweet, for a popular treat known as Pralines (unrelated to chocolates) made popular by the Ursuline nuns that emigrated from France in the early 1700s. A decadently creamy and decidedly sweet treat, these candies are a great souvenir option should you find the need to bring back a taste of the Big East with you. Southern Candy Makers makes a delicious version of this sweet, and feature flavors such as peanut butter, rum, chocolate and more. Our final stop for the night was Commander's Palace, a New Orleans favorite for creole fine dining, popular with locals and tourists alike. Its located in the beautiful Garden District, which feature a abundance of historical mansions and cemeteries. 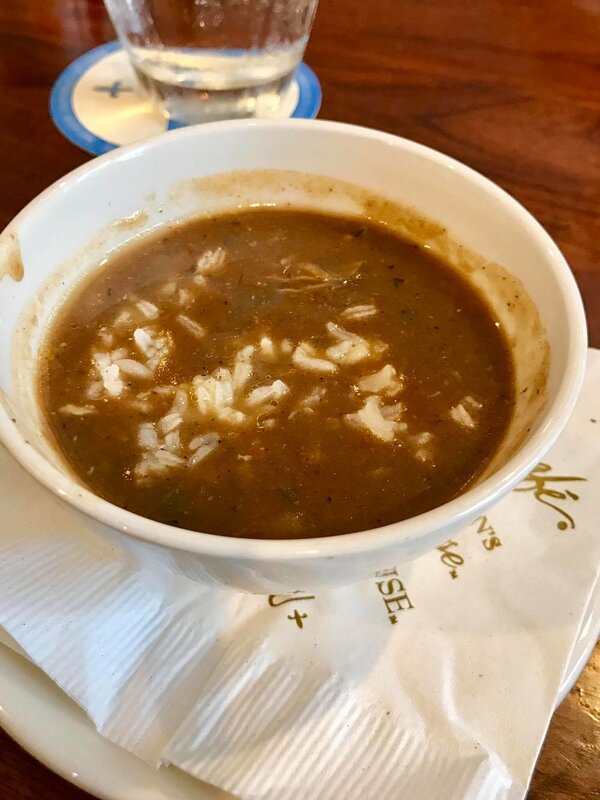 Some dishes that came recommended were Commander's famous turtle soup, which does indeed feature its namesake ingredient in the dish (I checked), and is best served with healthy dose of sherry on top. Seen here in the trio of soup tastings, which also include a seafood gumbo and a soup of the day. Shrimp and foie gras appetizers, not as notable but quite good, though its hard to go wrong with any combination of foie gras and heat. My favorite of the night, a fried soft shell crab main dish tossed delightfully with cabbage, onion, tomatoes, corn and other greens. The crab is fried to perfection, and plays delicately with the flavors that dress the rest of the dish. Well played, commander. A brief interlude about the climate of New Orleans. Even though I was lucky to have mostly sun in the three days of my visit, 'when it rains, it pours' is an aphorism that generally applies here. Don't be afraid to see rain, however. 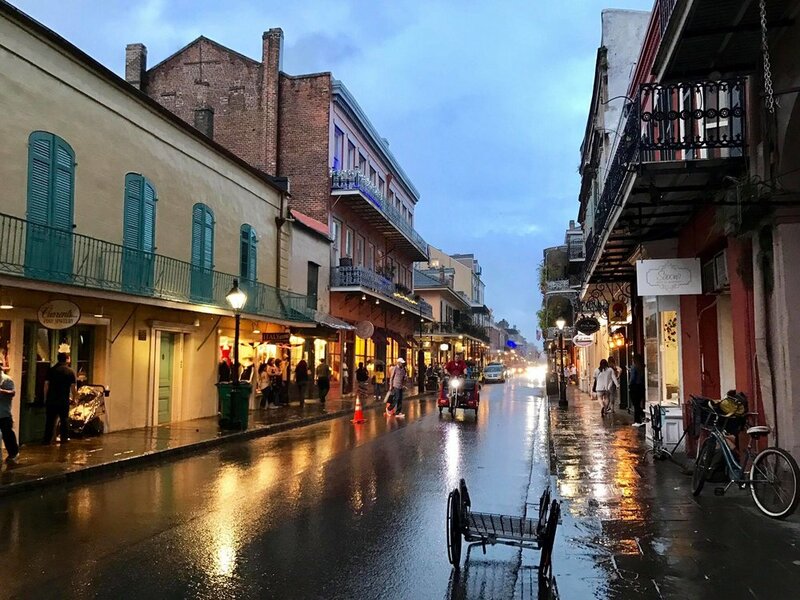 Armed with an umbrella, roads in the Quarter become mirror-like in a downpour, providing a slow, romantic lull that juxtaposes the usual pace and vitality of these streets. Our second day here began with, as per most of my trips, food. A few stops for some local favorites as a makeshift, two-stop brunch before heading to another out of town destination. The first stop was for a much-loved New Orleans pick, the muffuletta sandwich: a distinctively Italian import. Central Grocery is typically credited with inventing the specialty, and as its name suggests, it is indeed a grocery store selling mostly Italian imports. A typical muffuletta features provolone, mortadella, and mozzarella cheese under slices of salami and ham, topped with a chopped marinated olives mixture unique to each shop that sells the sandwich. Central Grocery will sell them by the whole or half, which can be cut into four or two wedges respectively. If you're just traveling in a party of two like I was, I suggest a half portion, quite enough for a duo. Next stop: Verti Marte, a 24-hour grocery that serves up some of the meanest po'boys in town. True to its name, the store and deli lacks any form of seating, and is indeed a no-nonsense deli/grocery store. You order from the man behind the glass counter, and pay once you receive your food. Verti Marte is most known for their 'all that jazz' specialty sandwich (ie. 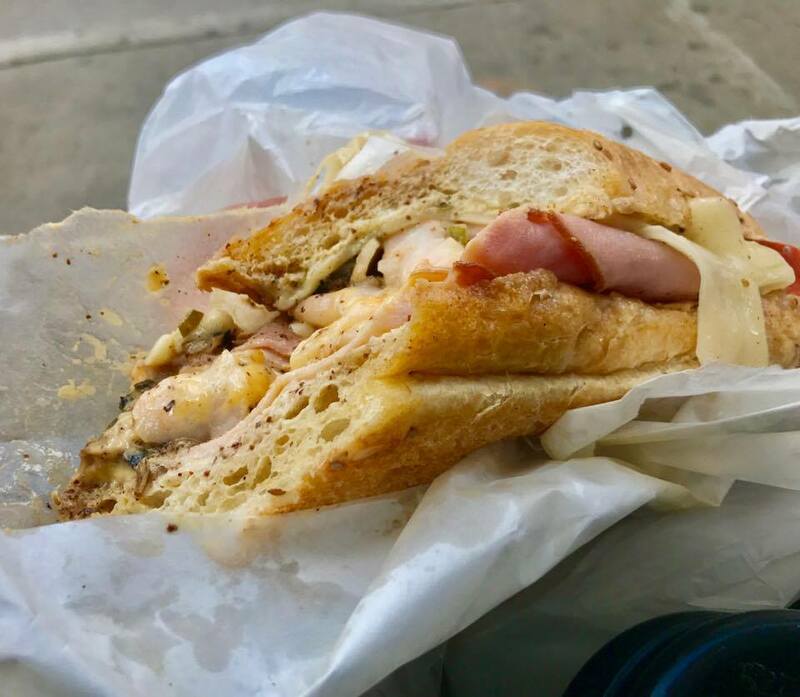 po'boy), which consists of grilled ham, turkey, shrimp, slices of Swiss and American cheese topped with mushrooms and tomatoes all wedged between two slices of thick cut French bread. Definitely not for the faint of heart, or not-hungry. Enough food for the moment, we headed to Oak Alley plantation, just about an hour outside of the city. 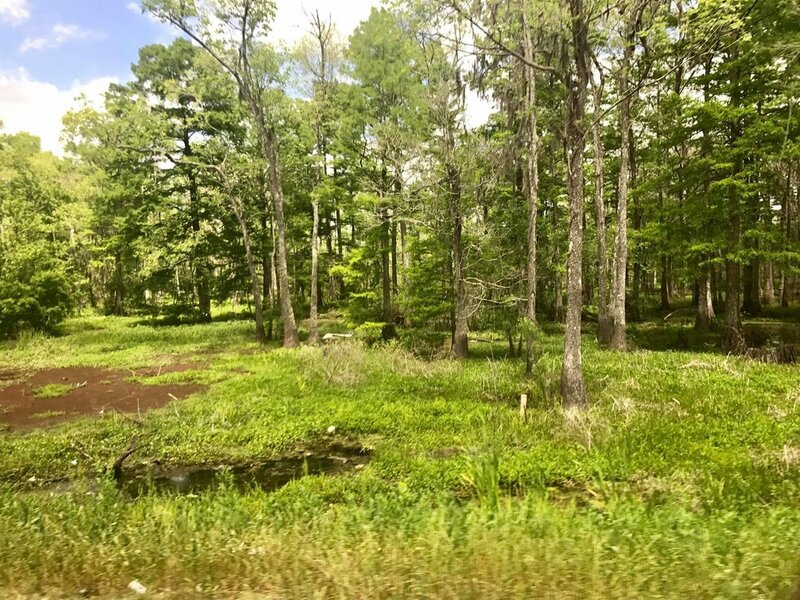 As we drove out of town, I'm reminded of how common marshland is found in the state of Louisiana. Passing by lakes and swamps, part of me wondered what lurked beneath the shallow waters and amongst the dense vegetation. (Read: probably crocodiles). Known for the ancient oaks that line the front of the property, the plantation is also a historical landmark that serves as a remainder of various eras of Louisiana history -including the slave trade in the 18th and 19th centuries. The oak tree themselves are truly beautiful as rumored, and I had never before seen trees as twistedly graceful as these. Caught under the brilliant sun, these wondrous monstrosities shaded much of the grounds directly in front of the big house, and the pathway leading up to it. The plantation's big house (main house) is also statuesque and features prominently on the grounds. The foundation that currently runs the plantation provides bi-hourly tours of inside the mansion. A worthy half hour spent learning about the history of the families that have owned the grounds, as well as a gorgeous view from the second floor terrace that was once a favorite of the last matron of the house. Estimated to have been planted in the mid-1700s, these tri-century oaks have become synonymous with the plantation itself and were planted even before the building of the house. A sight to behold, especially from a higher vantage point. The grounds also feature a recreation of the slave dwellings that would have existed in the centuries before, as well as a civil war exhibition to denote the part Oak Alley played in the Civil War. A wall within one of the recreated dwellings that memorializes the names of all the slaves presumed to have worked on the Oak Alley plantation; a somber reminder of the days past. Upon returning and decidedly full from the morning's sandwich adventures, dinner reservations were abandoned for a tasting of a few more of the city's unique eats. First up was Drago's, known for its charboiled oysters that were sadly more delicious that photogenic. In my personal opinion, far more compelling than the oysters themselves was the garlic butter sauce that the morsels came drenched in. At first a bit confounded by the hunk of baguette that came with the dish, I quickly discovered dipping the carb in the leftover sauce was absolute heaven. Second stop: Mr. B's Bistro for some of their famed grilled shrimp. Accidently stumbling on the best pecan pie I've ever tasted at this French eatery, it was also our last food stop for the day. As with the charboiled oysters, dipping the paired bread in the leftover concoction was once again the highlight of the dish. The pecan pie topped with vanilla ice-cream, drizzled in caramel sauce (right) was hands down some of the best I've had. Also of note is their vanilla brownie, slathered in a combination of melted chocolate and marshmallow. Out of sheer curiosity and in dire search of a digestif, we ventured into the Carousal Bar post-dinner. The bar quite literally revolves, albeit at an imperceptible pace, so as to not add to the lack of balance already induced by what it serves, presumably. The rest of the evening was spent in pursuit of art and culture, both of which New Orleans features in abundance. 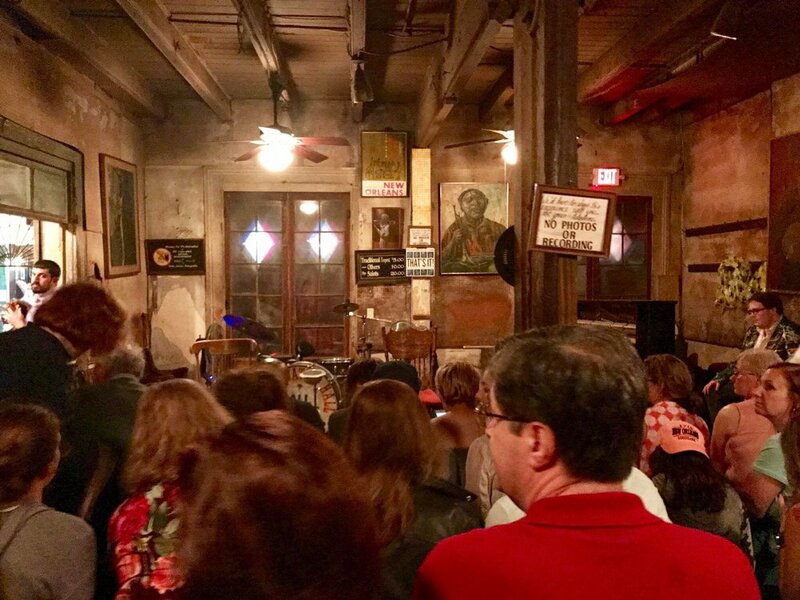 For jazz, a resident staple and tourist favorite was Preservation Hall, which features nightly performances of traditional jazz that last about an hour. Though the music was fantastic and the atmosphere infectious, the set itself lasted for no longer than forty minutes, after about a half hour waiting in line. As previously mentioned, the best time to stop by Café Du Monde is probably during any off hour. Peckish around 9pm on that Saturday, we were greeted with no lines at the café, thus graced with the opportunity to finally sample the much talked about beignets of New Orleans, paired with a simple café au lait. Personally, beignets very closely resemble the fried dough sticks typically eaten for breakfast in China, except with a healthy dose of powdered sugar on top. An interesting moment of east meets west. From the cafe, Frenchmen Street is just a fifteen minute walk away. The entire avenue is filled with various jazz clubs and music venues, making it the top choice for a night of bar hopping. In particular, the Spotted Cat is popular for its nightly performances, and on Fridays and weekends, there is usually a wait to enter the club. In addition to live performances, the street also featured an art market, which had an interesting exhibition that showcased the signs of the homeless, whom are frequently found in the street corners of the French Quarter. For a more traditional bar scene, look no further than Bourbon Street, which can get quite rowdy at night with a crowd that persevere well into the AM. As per usual, the day starts with a bite to eat. Or in this case, several bites at several different stops. First up is Tableau, which serves up an authentically delicious gumbo. As is the norm here, they also make beautiful cocktails to go. Not a bad way to start off the morning. Next stop: the French Market. The oldest of its kind in the United States, this market was established even before the Europeans arrived in North America. Millennia ago, it was a trading post for Native Americans. Today, there are various stalls that sell everything from food to grocery items to a weekly flea market. One of the stalls here is rumored to serve a better muffuletta sandwich than the grocery that invented it. 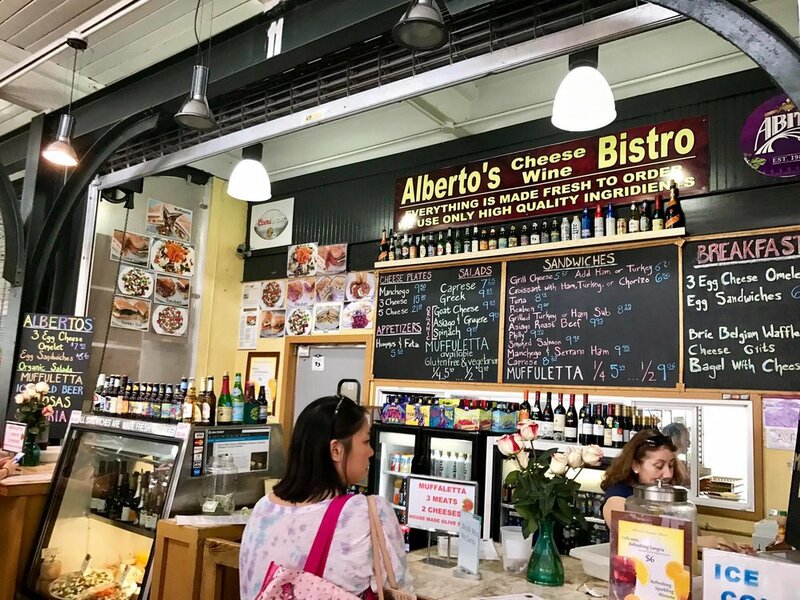 Alberto's Bistro at the French Market uses fresh olives in their marinated chopped olives mix, and after sampling their take on the sandwich, I'm inclined to agree that its indeed better than Central Grocery. Tajague's (pronounced 'Tu-jacks') is the second oldest restaurant in New Orleans, after Antoine's. Serving up typical creole fare, their brisket is supposedly some of the best in the city, and their bar features a mirror that dates back two hundred years, imported directly from France. Creole Cookery makes a mean sausage and chicken jambalaya, if you're in the mood for a hearty dish after a day of walking. 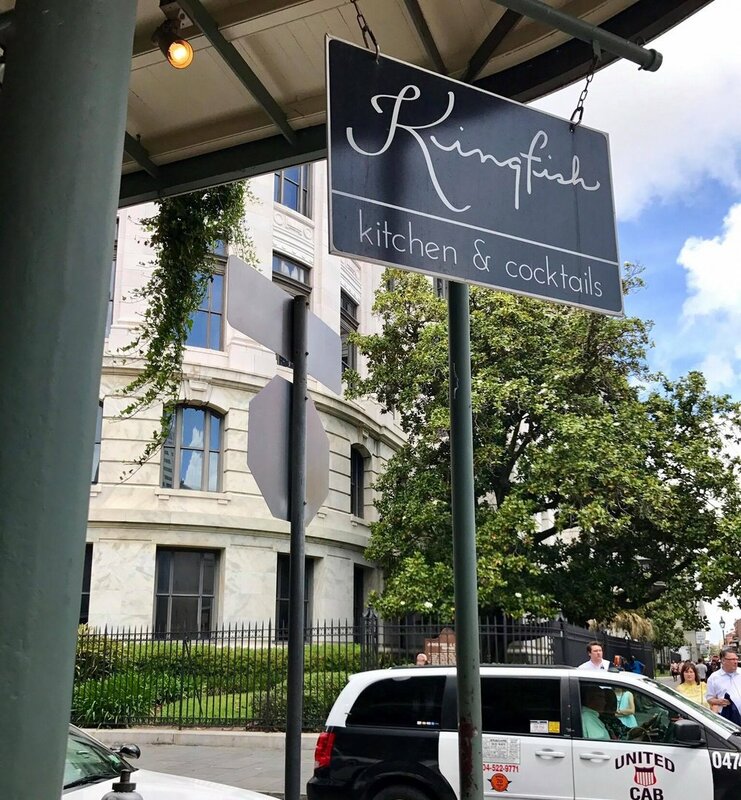 Kingfish is another local favorite, especially if you're looking for pre/post meal drinks, or just a drink in general. The restaurant has a large, full-service bar that serves up pretty, and pretty strong cocktails, so don't let appearances fool you. After having a fair sampling of the alcohol served in this city, its my statistically validated conclusion that bartenders here are definitively heavier with their pours. Not a bad thing, to be sure. If you swing by, be sure to try the fried boudin, a reinterpretation of this typical Louisiana staple that removes the casing of the sausage and fries the typical ingredients instead. Last but not least, we stop at Antoine's for their Easter Sunday brunch. 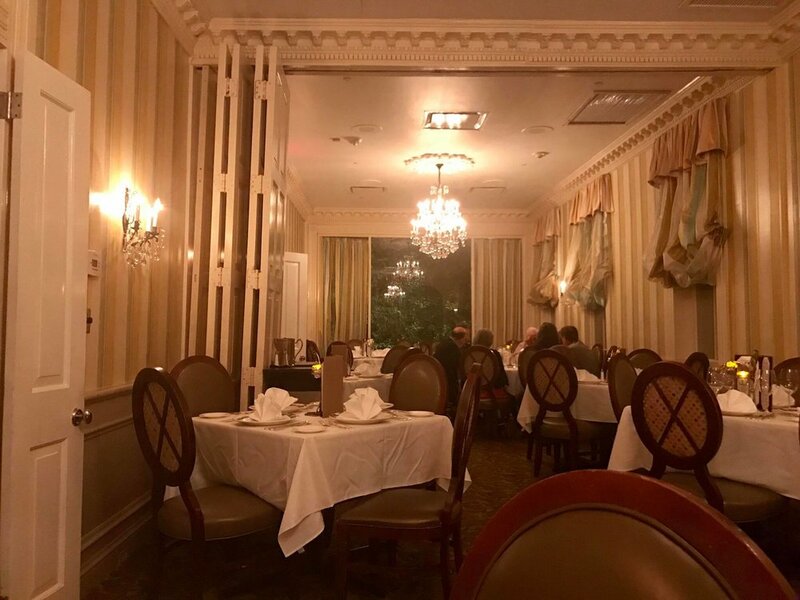 Antoine's is the oldest restaurant in New Orleans, and the longest continuously operating restaurant in the United States. Even almost 200 years later, it is still owned and operated by the same family that established it in 1840. As is typical of every Sunday brunch at Antoine's, there is live jazz performance in the venue. We opted to skip the Easter set menu and ordered a la carte instead. Oysters Rockafeller was invented here on the premises, thus a must-try. The popped potatoes on the right are also airy and crispy, somewhere between a French-fry and chips, and a delightful beginning to a meal. 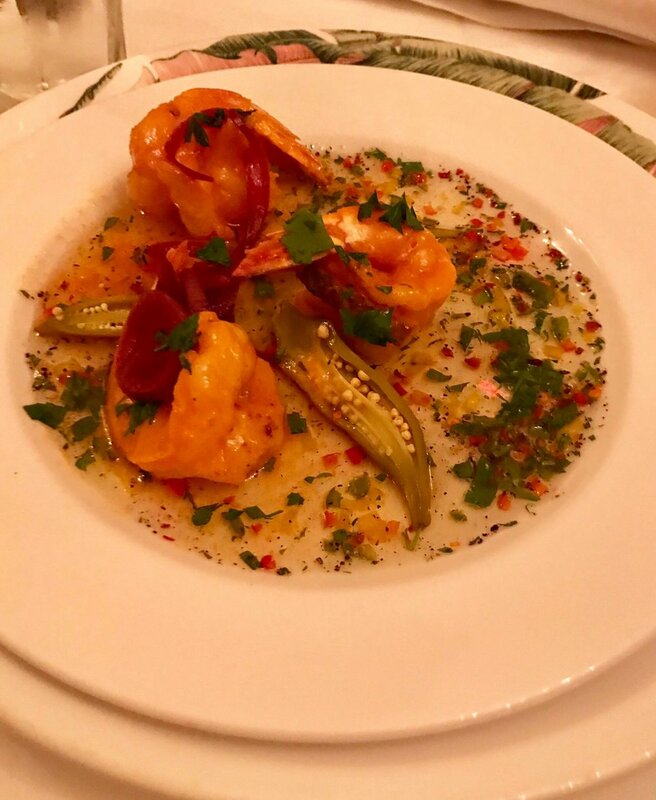 Shrimp and 'grits, a southern staple. Made with a little something extra via the fried asparagus on top. An interesting but welcome addition to the otherwise traditional plate. With an hour to spare before our flight out of New Orleans, we decided to make a stop at the local Aquarium. It features all the typical exhibits that one would expect, including an underwater tunnel and a sting-ray touch station. Of note are the sea-otter exhibit and the albino crocodile. These crocodiles must be rescued from the wild due to their lack of ability to camouflage and thus low survival rate. And that's it for New Orleans. Overall, an incredibly enjoyable long weekend mired in spirited atmosphere of the city. This being my first time to the stereotypical American 'deep south,' I had a thoroughly incredible experience and my (very) fair share of local cuisine. Will definitely recommend, and will definitely be returning here.